Since March 2016, the usage reports in the Office 365 admin center have been providing admins with insights about how users adopt and use the various services in Office 365. 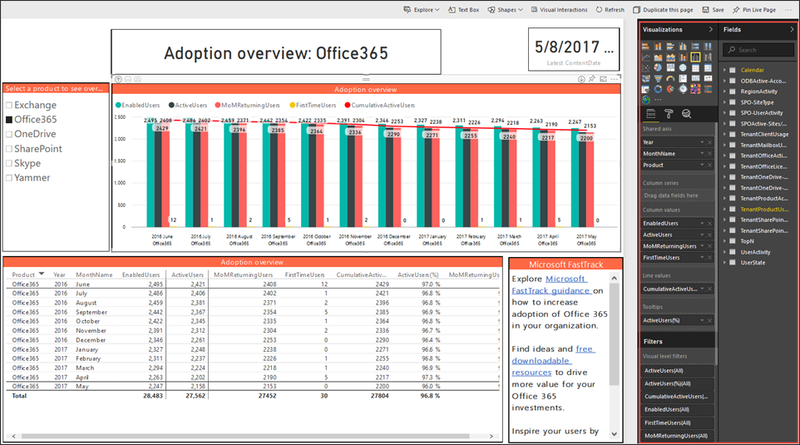 Today, we’re pleased to announce the public preview of the Office 365 adoption content pack in Power BI, which enables customers to get more out of Office 365. The content pack combines the intelligence of the usage reports with the interactive analysis capabilities of Power BI, providing rich usage and adoption insights. With these insights, admins can drive more targeted user training and communication that helps them transform how their organizations communicate and collaborate, enabling a truly modern workplace. 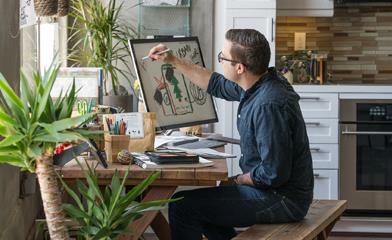 Office 365 gives users the freedom to work from anywhere and the services they need to be more productive and collaborative. Sometimes, however, people need a helping hand to get started with Office 365. For example, if someone doesn’t use Skype for Business, they might not know how to get started using Skype or understand how they can leverage it to communicate better. In either case, the IT department might want to connect with this person to provide them with more information or training resources. The new Office 365 adoption content pack gives you a cross-product view of how users communicate and collaborate to help IT admins provide more targeted user communication. When you better understand how employees use the various services within Office 365, it is easy to decide where to prioritize training and communication efforts. 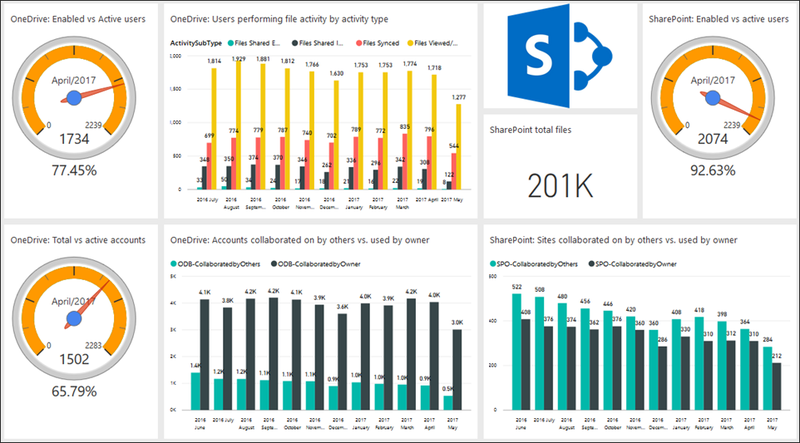 The content pack lets admins further visualize and analyze their Office 365 usage data, create custom reports, share insights and understand how specific regions or departments use Office 365. The centerpiece of the content pack is a pre-built dashboard, which provides IT admins with a cross-product view of how users are accessing the suite of products within Office 365. For most of the metrics, the content pack provides data for the last 12 months, so you can easily see how usage is trending and has evolved over time. The dashboard is split up into four main areas: Understanding adoption, Communication, Collaboration and Activation. Each area provides you with specific usage insights. 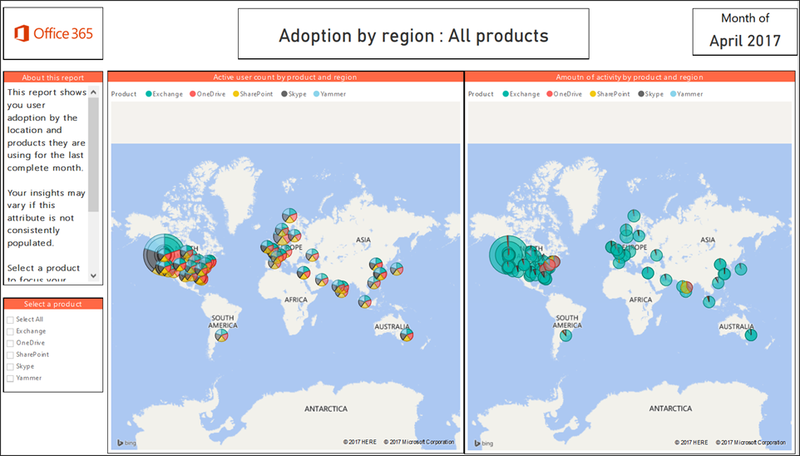 Understanding adoption area—Offers an all-up summary of adoption trends that helps you understand how users have adopted Office 365. You can easily see how many licensed users actively use the various Office 365 services, what combination of products are popular within your organization, and analyze adoption trends for individual products. Communication area—Highlights the services that people use to communicate, such as Skype for Business, Exchange and Yammer. You can see which communication methods are used most by users and drill into details to understand if there are any shifts in how employees use the various tools to communicate. Collaboration area—Shows how people in your organization use OneDrive for Business and SharePoint to store documents and work together—including how many users are active on their own accounts versus accounts owned by others. This information is a good indicator to understand if people use OneDrive for Business and SharePoint primarily to just store files, or if they are also using these services to share content and collaborate with others. Activation area—Helps you understand Office 365 ProPlus, Project Pro and Visio Pro activations in your organization. You can easily see how many users have activated the products, enabling admins to ensure that users have the latest versions of Office applications. The report also provides information about the type of device users have activated the products on, helping admins understand what devices are popular in their organization and how many users work on the go. Every organization has unique questions around usage and adoption. The content pack helps answer these questions, enabling you to pivot, analyze, customize and share the information. Analyze usage by department, organization or location—Many of you want a full picture of how specific departments or regions use Office 365. To enable these advanced analytics scenarios, the content pack combines the usage data of users with their information in Azure Active Directory (AAD). You can pivot the reports by AAD attributes like location, department or organization information. Leverage built-in filters to get insights relevant to you—On many reports, contextual filters allow you to easily slice and dice the data available, for example, to understand adoption trends for individual products. Quickly find out who your power users are—The content pack includes a user activity report for each service to identify power users. These users typically have very thorough product knowledge and can help train other users. They can share how they are using the service, how it helps them every day to be productive, and offer tips on how to get started. Power users can help lead the digital transformation in your organization by example. The user activity report also lets you identify users that have yet to use a particular product. Armed with this information, you can be very targeted in your adoption campaigns. Customize the content pack—The dashboard and the underlying reports are templates to help you quickly get started with the content pack. The true power of the content pack lies in the underlying data. We want admins to have full control over their data, so we have made sure that you can customize the content pack and structure the charts based on your organization’s needs. Take one of the pre-built visuals and modify it—by removing information or by changing the visual format, for example. Create a brand-new visual by leveraging the underlying data sets. 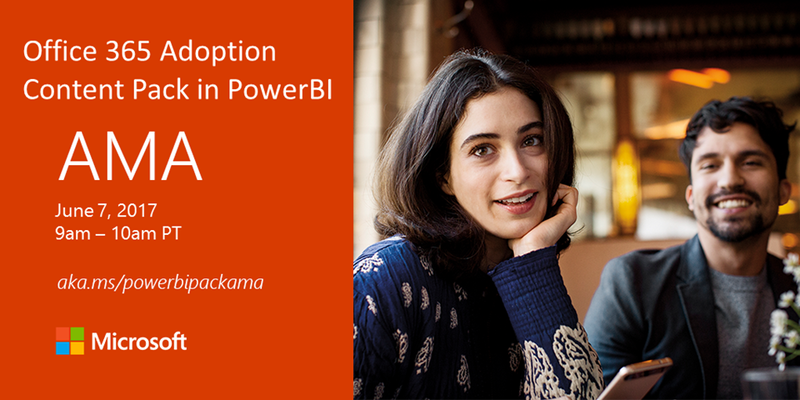 Connect to the pbit file in Power BI Desktop, which enables you to bring in your own data sources. Share the content pack—Using the sharing capabilities of Power BI Pro, you can easily share the dashboard with people both inside and outside of your organization, such as business stakeholders or your leadership team. The content pack is available to all customers free of charge. You’ll only need the free Power BI service to connect to the content pack—use your Office 365 admin account to sign up. You can also customize the dashboards and reports with the free Power BI service. To connect to the content pack, you first need to enable it in the Office 365 admin center. On the Usage Reports page, you will see a new card at the bottom of the page where you can opt in to the content pack. This step kicks off a workflow that generates your historical usage trends. This data processing task takes between 2 and 48 hours, depending on the size of your organization and how long you’ve been using Office 365. After data preparation is complete, it’s ready to show in the content pack. Please follow the steps described to connect to the content pack for your organization. 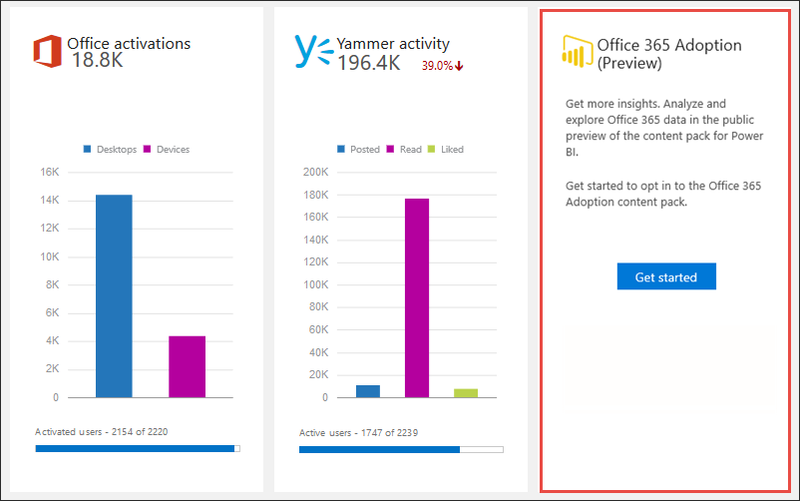 Try the public preview of the Office 365 adoption content pack in Power BI and provide feedback using the feedback link in the lower-right corner of the Usage Reports page in the admin center. And don’t be surprised if we respond to your feedback. We truly read every piece of feedback that we receive to make sure the Office 365 reporting experience meets your needs.